Who loves dice activities?? There is just SO much you can create with dice. My very first center that I ever created involved dice and I realized just today that I have never uploaded this center to my TpT store. The first version I made (3 years ago) was VERY boring and I *think* I may have even used comic sans. I know, it was bad! I got to thinking about all the cute fonts I've got and all the cute clipart that I'm addicted to and I decided to revamp this center and share it with y'all. It's called Roll, Read, and Write. The thing I love most about this center is that it's simple and easy to use. After you've created the notebook, it's one of those centers you can just easily pull out. 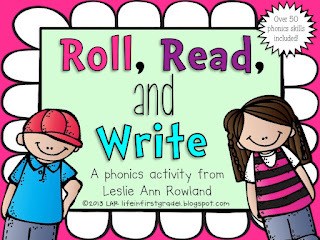 You don't have to worry about making copies of a recording sheet (I use journal paper for the writing portion of this activity) or if all the pieces are there. Super simple. You can find this center here. Head over to Facebook to enter to win a copy! The other dice activity that I created is super fun and I can't wait to show my kids. It's called This is How We Roll. It's another simple center that can easily be pulled out. After you copy all the pages, simply put them in page protectors and slide them into a notebook. Directions for playing are simple. The game can be played with a group of kids or individually. 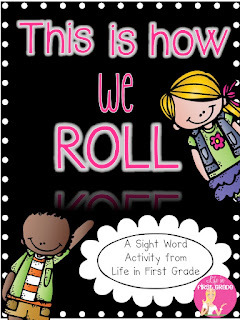 Each student will roll the die and then read the group of words or fry phrase that it beside the same child graphic that the student rolled. Simple and fun. You can find this center here or head over to Facebook to enter to win it! Comic Sans!!! GASP!!! :) That used to be all I EVER used! Right there with you on dice/die! I say dice! I refuse to day die! :) These activities look really cute! These are SO cute! I can't wait to use them with my firsties!! !